The holiday season is busy, but if you can make time to visit a Disney park during the winter at least once in your life, you should do it. From November until January, everything at both Disney World and Disneyland is decked out with all kinds of Christmas lights and decorations, and best of all? Right after the New Year, the decorations come down and the parks are practically empty. Around this time, the weather is so much nicer than it is during the summer since both parks are located in year-round warm climates. 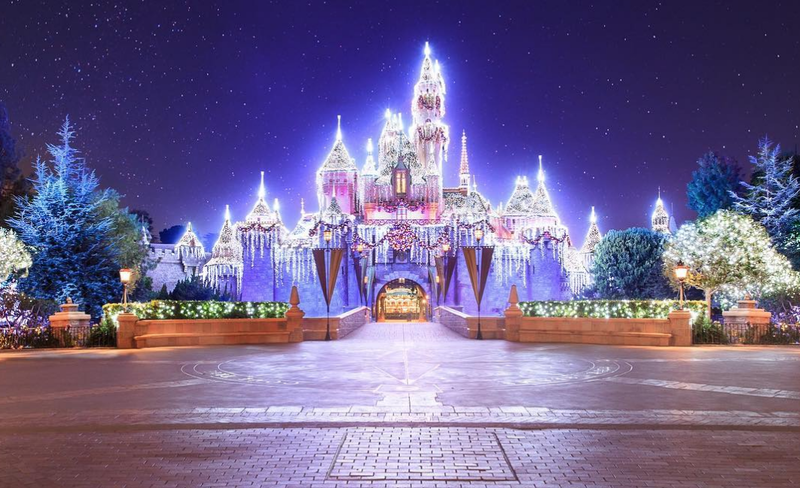 If you’re planning to head to either coast this season, you might be wondering what to pack for Disney in the winter, and that’s a good question considering it’s a very different trip if you’re used to traveling there when it’s hot outside. Want to be prepared? Here’s everything you’ll need to bring on your trip. Winter weather at Disney can be very unpredictable, so it’s important to pack a little bit of everything. You’ll want to have some clothes for cooler temps (think leggings, long sleeves, and a sweatshirt or two) but also a few outfits if it turns out to be warm, like shorts and short-sleeved tops. In December, you can expect temperatures in the high 70s during the day and 50s at night in Florida, according to Accuweather, while Anaheim will be a bit chillier, with temperatures in the 60s and 70s during the day and 50s at night. Basically, you should make sure you bring a sweatshirt along when you leave for the day or plan for a midday outfit change. No matter what time of year it is, Disney requires tons of walking—sometimes more than 10 miles per day—so make sure you bring your most comfortable shoes…and also bring a backup pair. Switching shoes every other day can help you to avoid blisters and might make your whole trip a lot more enjoyable. Because who goes to Disney without ears? If you don’t have any and don’t want to wait to get a pair when you arrive, you can grab a pair online at ShopDisney.com or even try looking on Etsy if you want a more unique option. Even if the temperatures are cooler, you’ll be out in the sun a lot, so stay protected. Your skin will thank you. As long as the list of yummy snacks to try at Disney is, you can end up breaking the bank very easily. Disney allows you to bring in your own snacks and drinks, so you may want to pack bottled water and individually wrapped snacks, like granola bars and fruit snacks, to munch on when you’re standing in line and starving. Particularly in Florida, the winter months can bring in heavy rain, and the last thing you want is to be stuck in the park hiding in a gift shop when you could be out there taking advantage of the shorter lines. Pack a compact umbrella and a rain jacket—extra points if it folds up small enough to fit in your bag. A dollar store poncho can work, too! Because let’s face it: you’re going to shop, which means you’re also going to need room to pack your new stuff. Have an awesome trip in that amazing weather, and say hi to Mickey for us. You’re going to create some unforgettable memories—just don’t forget a light jacket.